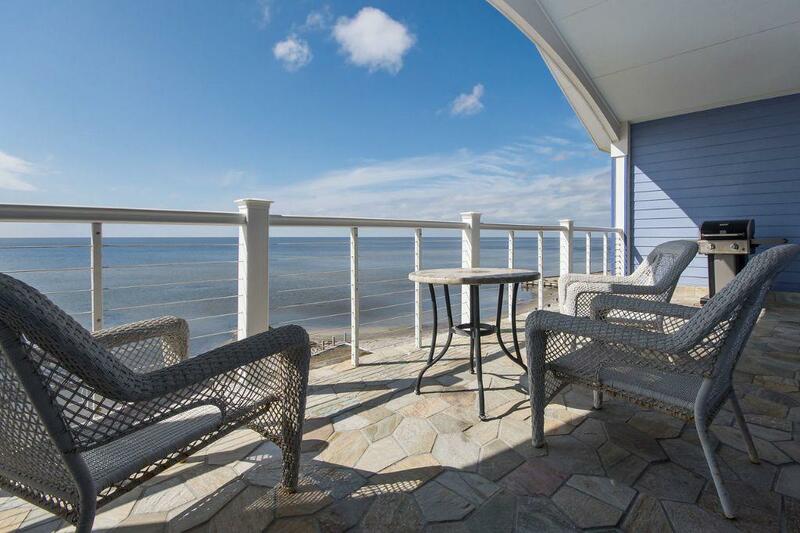 Nights in Rodanthe offers amazing top floor sound views at the Waves Village Resort. The soundfront living room has upscale rosewood furniture, surround sound, vaulted wood beamed ceilings, and huge postcard views of sound and sunsets. Warm wood laminate flooring and tiled entry accents throughout. The large open kitchen has stainless appliances, soapstone counters, breakfast bar that is perfect for entertaining. A long soundfront deck has a private hot tub and gas grill. Spend all NIGHTS IN RODANTHE just a mile south of where the movie was filmed! BR1 is a king master with deck access and tile shower. BR2 is a queen master with deck access and full bath with tiled shower. BR3 is a large king master with tiled bath. Queen sleep sofa in living room.. Enjoy a 70’ soundfront pool and easy launch to Pamlico Sound for world class kitesurfing, SUP, and watersports. Guests can harness the power of the equipment and instructors of adjacent Kitty Hawks Kites flagship store for the vacation of a lifetime. Features include: DVD player, private hot tub, outdoor shower, onsite kiteboarding / watersports, air pumps, storage locker w/board racks. Elevator access. Washer/dryer. Pet Friendly (fee). WiFi. Resort amenities include: onsite Good Winds Restaurant & Bar, coffee shop, onsite ropes course (NEW).